So recently i haven't really written anything new so today I'm going to do a would you rather (beauty edition) I'm only doing 10 questions and found these questions online while looking at other tags i could do. And to everyone that reads this blog post...i challenge you to do this beauty tag! 1. Would you rather go out with messy hair and nice make up or nice hair and no make up? I'd rather go out with messy hair and nice make up, i often get stuck with this question, because ill be doing something and someone will be like come on were off and then I'm like owww what do i do, do i do my hair or my make up? Make up can make your hair look okay, like a messy bun or something makes your look, look simple..
Id rather have my eyelashes fall out because there grow because before i know it and while i was waiting for them to grow back i could wear fake lashes. but no eye brows would be sooo weird! 3. Would you rather be forced to shop at only MAC or never be able to not use MAC for the rest of your life? 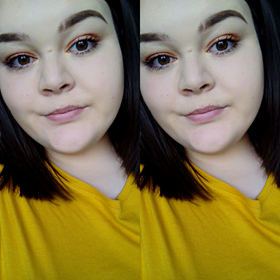 Not MAC but id try and find products that are nearly the same because i love love love MAC products, even though its not in my current make up at the moment i love the eye shadows and blushers! i also love the mac strobe cream, because i have very dry skin and it helps so much! 4. Would you rather give up your favorite lip product or your favorite eye product? My favorite lip product at the moment, is a Rimmel London product, Number 107 lasting finish matte by Kate Moss Which is a dark-ish purple. And my favorite eye product is the Maybelline go extreme mascara. But id rather go with out my lip product because my favorite lipstick right now is really bold and my eyes would look lost, so id rather have my eye products. 5. Would you rather leave the house with really thick eyeliner or overdone blush? I'd rather go out with really thick eyeliner because over done blusher would just make you look like a clown, and i feel like some people wear really thick eyeliner so maybe i could work with it. Id have to say Mc hammer pants, because walking around in biker shorts in public would just be humiliating. id rather wear baggy clothes than tight ones. 7. Would you rather have a bad orange-y spray tan or really weird tan lines that cant be covered? A Really bad orange spray tan because it would fade where as weird tan lines could be caused from a sun tan there forth would take a while to fade or go away! 8. Would you rather have a bad hair cut or a bad hair colour? Iv had lots of different hair colour's so id rather have a bad hair colour than have a bad hair cut because i think I've pulled off most of the coulor's iv had before so i wouldn't really care. 9. Would you rather have your blog or twitter taken away forever? If i had to give up one of these then id rather give up my mascara, because i could give up my brushes but id find it hard to fill my eyebrows, and put on my eye shadows.